A mental health fieldwork may sound completely foreign. Images of psych wards, straight jackets, and One Flew Over the Cuckoo's Nest may come to mind. First of all, a mental health fieldwork can take place in a wide variety of locations including homeless shelters, outpatient and day treatment locations, or even community centers. However, if you are going to an inpatient location or a state hospital, there is certainly a stigma about mental health in our culture. Many OT programs encourage or require mental health fieldwork placements and yet, traditional mental health makes up only 2-3% of the OT work force (AOTA, 2015). However, don’t be fooled by this number. From a holistic perspective, mental health is a factor to consider in every patient. With specific populations like autism spectrum disorder (ASD) and traumatic brain injury (TBI) or broad populations such as veterans and rural populations, mental health remains an immensely important factor even though you may be primarily addressing other physical symptoms. With the right resources and approach, you will be able to enjoy your mental health fieldwork and pass with flying colors. Who knows, you may even decide to become a traditional mental health OT! 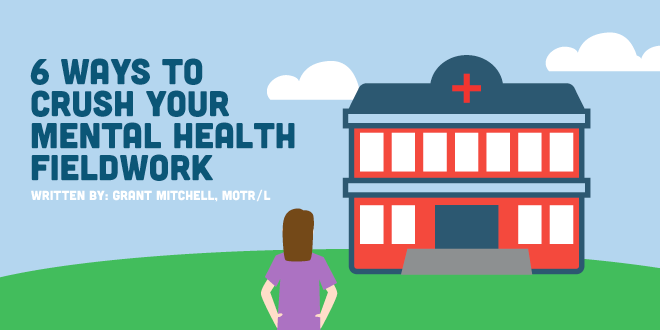 Here are 6 tips, resources, and words of encouragement to make your mental health fieldwork a blast. Professionalism is always important. However, dressing professional doesn't always mean professional dress. That is why it’s important to know your population demographics. If the majority of your clients live in poverty or rural areas, dressing "down-to-earth" may be one of the most influential factors in developing rapport. First impressions have a lasting impact. Take extra care to check with your advisor about what kind of dress code they suggest. It’s also important to recognize what type of treatment will take place. In mental health, chances are sawdust, paint, glue, and even glitter may get all over whatever you wear. First and foremost, the primary learning for mental health should come from course notes, your faculty, textbooks, and research. These sources should always be approached prior to secondary and tertiary sources such as blogs, Pinterest, and online resources. These are great for inspiration, but should not inform practice in-place of evidence. However, depending upon when your OT program incorporates mental health fieldworks and when you actually complete a mental health fieldwork, you may have sold, borrowed, stored, lost, or forgotten which books might come in handy. In case you forgot, here is is a quick list of helpful and needed mental health textbooks. MH4OT: Being connected to other therapists is incredibly valuable in feeling confident, developing ideas, and avoiding isolation. MH4OT is a facebook page and a great resource for posting questions or seeing discussions about current or relatable topics. Tina Champagne: If you do use Pinterest, there is no doubt that THE mental health profile to follow is Tina Champagne. She has inspiring boards on a variety of topics and is an expert in the field of sensory processing. Which happens to be a common aspect of mental health treatment. Therapistaid.com: It’s important to remember that evidence based practice is a must. Though this is not an OT specific website, making treatment occupation based is largely influenced by how the chosen tool is used in relation to what the client finds meaningful, as well as their preferred goals and routine. Examples could include the progressive muscle relaxation script and gratitude journals that can be found at this website. Reviewing your mental health fieldwork site information is a valuable step in deciding what assessments to prepare for. Some sites have an orientation packet that may list assessments. While others may have it on their website. It’s always a good idea to visit your mental health fieldwork website prior to starting just to get an overview of information like the vision, mission, and models of health care provided. When in doubt, contact your supervisor and ask. For in depth descriptions and uses of mental health assessments, refer to Assessments in Occupational Therapy Mental Health: An Integrative Approach. However, here is a quick few assessments you are likely to come across in a mental health fieldwork. HIPAA is always important everywhere! It is especially important to be familiar with HIPAA policies in mental health. Simply put, don't talk about patients unless you are in the appropriate place. Which is nowhere around other patients or open areas where your voice can carry. A patient overhearing you talk about their broken arm might not get that upset. Imagine how it might feel for a patient to overhear a therapist talking about their psychotic symptoms. Mental health is taken very personally, so guard protected patient information (PPI) as if it were your own! This also includes written materials and notes you may be jotting down during treatment. Imagine how it might feel for a patient to overhear a therapist talking about their psychotic symptoms. Mental health is taken very personally, so guard protected patient information (PPI) as if it were your own. This also includes written materials and notes you may be jotting down during treatment. Communication with your advisor is critical (Hanson, D. & Schumacher, A. 2014). It’s important to begin the fieldwork with strong communication and clear guidelines. Some students may feel an informal pressure to re-invent the wheel with every group or simply be struggling to manage personal life in addition to the mental health fieldwork. If you're feeling under confident, burned-out, anxious, or short of ideas, remember to utilize your advisor! Hopefully, this article brought you a few new ideas. But don’t forget to practice the mental health techniques on yourself. If we teach coping strategies, we should be modeling them. It is important for fieldwork students to have coping strategies as well (Hanson, 2014). Everyone, including OTs, has imperfections whether physical or mental, but an occupational therapist should at least be an example of implementing coping strategies. These might include (in case you forgot) deep breathing, walking, writing, or time management. Healthy engagement in occupation requires as much time management as does completing a mental health fieldwork experience.